“Who was Stephen Paddock – the Alleged Las Vegas Shooter?” or How can a dead man shoot people in Las Vegas…Maybe the CIA and FBI should stop covert gun sales to terrorist groups. 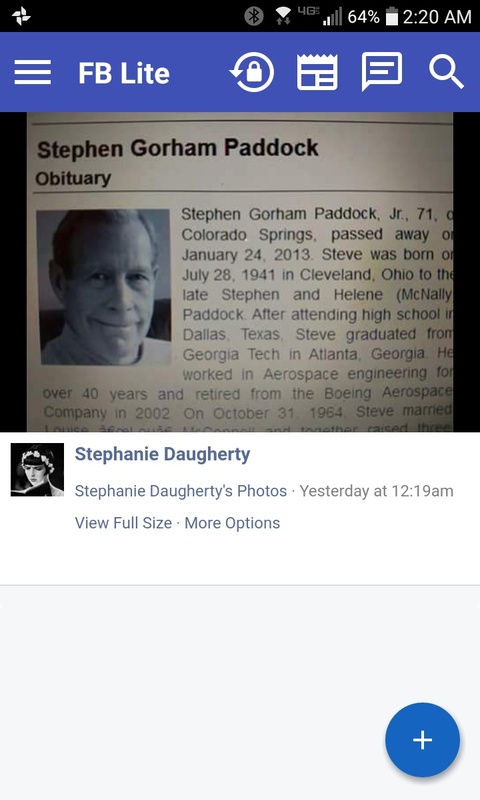 “Who was Stephen Paddock – the Alleged Las Vegas Shooter?” (By Robert David Steele). A retiree, a successful real estate investor, a grandfather, a hunter and fisherman, pilot, and a former federal employee even. He had no motive to slaughter dozens – and dozens of his own demographic at that.He had no expressions of radicalism, racism, or complaints ( not true as far as left wing agendas nad gun hater)of remotely applied MK-Ultra mind/behavioral control conditioning like many mass shooters that come out of the “electromagnetic psycho-pharmaceutical” gulag as Professor Darrel Hamamoto terms the mass subversive conditioning of the public and youth. He seemed to be quite normal, except for one minor point of note. Much of the press snuck in a reference to his employment at a Lockheed Martin acquired company. What was that company? Morton-Thiokol, Inc (Thiokol).